The new SRAM Centerline Rotor was designed to keep the center of friction consistent throughout rotation, thereby minimizing vibration and offering consistent performance and a quiet ride. Take advantage of the latest in SRAM disc brake rotor technology with the SRAM Centerline Rotor. It Works!! it's About Time!! Quite!! So far so good, only used them once but, I was on hard front brake (that was the problem) hard and nothing, no noise. I hope they stay that way. I could not believe this was such a difficult problem to solve. I can now use the brakes on my $3,000.00 bike without it sounding like a Swapmeet clunker. I don't have anything to compare product too, but rotors do work great. I have no issue with stopping and or control my speed. Only issue I notice is at low speed there does seam to be a little harmonics coming from the rotors. Its more vibration then noise. Much quieter than older style SRAM disc rotors. Solved my vibration issues. easy order, quick shipping without any gouging on the charges. Good looking rotors and were quiet when combined with the RSC. They just work. I didn't have any problems with these before, so I bought them for my new build. May try the lighter versions at some point though. Needed bigger rotors for better stopping power. Purchased replacement for previous rotor of the same size. These rotors work great. They're OEM, so they provide the same performance as how your brakes came new. Mine were bent very slightly from shipping, but easy to bend back to straight. My SRAM X0 brakes sounded like dying turkeys. Seriously... New brake pads did not help. Other types of rotors did not help. I hated those brakes until I purchased these centerline rotors. Problem solved.... Weeellllll, I still hate those brakes, but they no longer sound like turkeys. I always use centerline rotors on a new build. They are strong, contact with a large area of pad, and never squealing. My rotors were beyond minimum thickness. These were the same as the part number on my rotors. Easily searched the part number on JENSON and these came up. Always install with the new bolts. Exactly what I expected the produce to be and the service from Jensen is great! What is there to say. It's a rotor. It does what you want and I get no squealing when paired with metallic pads. Great price on SRAM rotors. Just what I needed for my gravel bike build. Great quality. Using these with the Guide RSC brakes. They look good and you can feel the pads dig in. I upgraded from a 170mm to this 200mm after experiencing it in a friend bike. It certainly improves breaking on the front. Love um. No noise, great heat dissipation. Other people I ride with, their rotors heat up and you can see the discoloration from the heat whereas mine show no signs of fatigue. Love these things. So far so good, quiet as mouse. Can't go wrong with any of the Sram products. Very good rotor, stopped the grabbing! Much better than cheap OEM rotors! Great price - fast delivery. In hindsight I probably should have ordered the lighter model, but all in all no complaints. 200mm was definitely a step up from the 160 rotors I was running. At first, I was kicking myself for not going to larger sized rotors. Once these Centerlines got broken in, I'm so happy with their performance! Very quiet and smooth and great stopping power for a 160mm. If I do upsize, I'm getting these rotors again. My go-to rotor. Comes true out of the box and stays almost quiet under heavy gritty and wet braking. I like how organic pads work predictably with the centerlines. 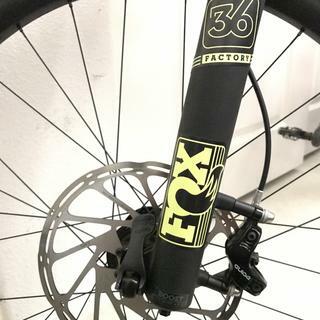 I bought a pair of these to setup a second wheelset for my fuel EX so that i could swap between 27.5+ and 29 tires, and they have worked flawlessly just like the factory set that came with it. 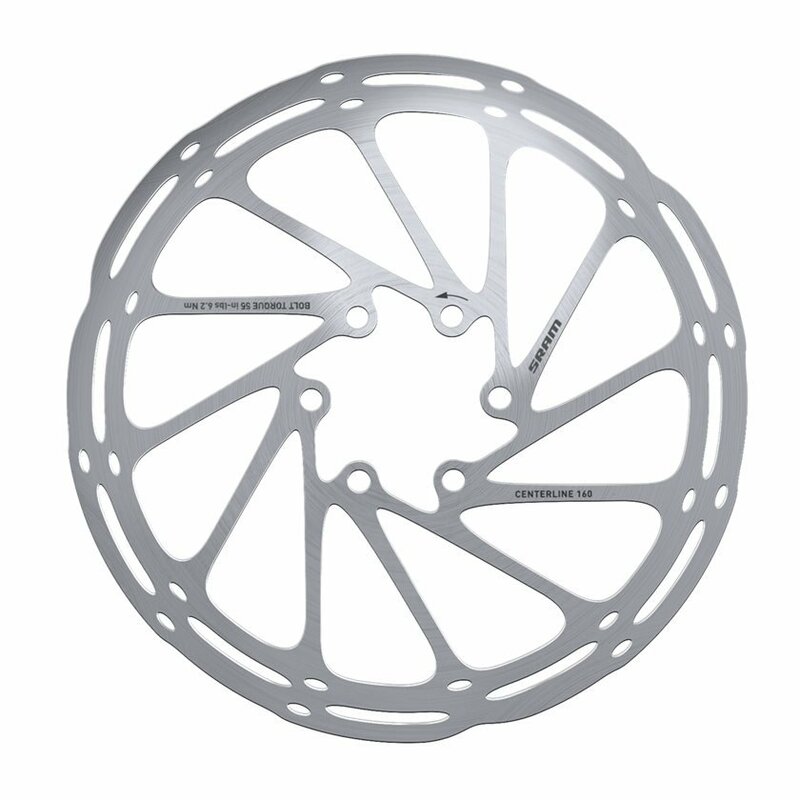 I am beginning to think that the modulation Sram Brakes have become famous for comes from these rotors. I am using these with Zee brakes and it definitely calmed down the harsh on/off feel of Shimano brakes. Maybe it is in my head but...my other bike has Zee brakes with RT86 rotors and they definitely bite much harder than the Zee brakes with these rotors. I guess if you are shooting for Sram brake modulation without the headaches of bleeding Sram brakes...running these rotors with Shimano brakes could be a solution. Worked perfectly with my new guide RSCs, Jenson was a huge help with a new bike build answered all my questions and gear always showed up on time or early. Easy install and bolts right into place. SRAM also includes a new set of mounting bolts and they're already coated with Loctite 242. Awesome! SRAM brakes and rotors are on the noisy side, but work well. Definitely worth the upgrade going to 200mm rotors over 180mm. It is very good a lot of stopping power and no to expensive. I recommend it very much. They are basic rotors IMO. If you are keen on keep it all Sram then go for it. Otherwise there are so many other better options. Very good design, works perfectly. Pretty standard rotor install. Much quieter than my previous rotors with good bite to them as well. Got it to my hotel on time (paid extra for a fast delivery). Didn't have any issues , so didn't try the service. Cons: Seems to turkey warble more than other rotors. Best part about brakes is when they work. These do just that. Haven't been let down by Jenson yet! The product was well packaged and placed between two oversized plastic bubbles for further protection. I was happy that Jenson delivered on the day that they promised, it's always very exciting getting the delivery from UPS. I've had great luck with these rotors. Always straight out of the pkg. I'm in the process of moving to Shimano brakes, however. Do bolts come with the SRAM Centerline rotor? BEST ANSWER: Thank you for contacting Jenson USA. Yes. The SRAM Centerline Rotor does come with the bolts. Can I use this with Avid BB7 mechanical brakes? I would think that is a matter of diameter and not the type of brake actuation. Yes, any rotor will work as long as it is the correct size for your bike. Yup! Just make sure the rotor size matches your caliper mount size. When installing the rotor what is the torque value to use for each bolt? BEST ANSWER: Mine was 6.2 N-m (~55 in-lbs). The required torque should be listed on the rotor itself. You may also want to double check the specs for your wheel to make sure it doesn't list any max. torque limits. 55 in-lbs. It says on the rotor (you can kind of see it if you zoom in the picture). It says right on the rotor. 6.2nm or 55 in/lb. Are the sram centerline rotors stainless steel? Which brake caliper mount do I need to fit a shimano xt caliper to a 160 mm rotor. The bike is a TREK liquid 25. I am mounting this on the front fork.